Earlier this year we reported on plans to introduce charges for car parking in Southwark Park and other green spaces in the borough. The council is currently running a public consultation (till 13 May) and Cllr Rebecca Lury – the deputy council leader whose portfolio includes parks – insisted at a recent overview & scrutiny committee meeting (video above) that no final decision to introduce charges has been made. However, income from the new fees is included in the council’s budget for the current financial year. Posted in Parks & open spaces, Politics, Transport. 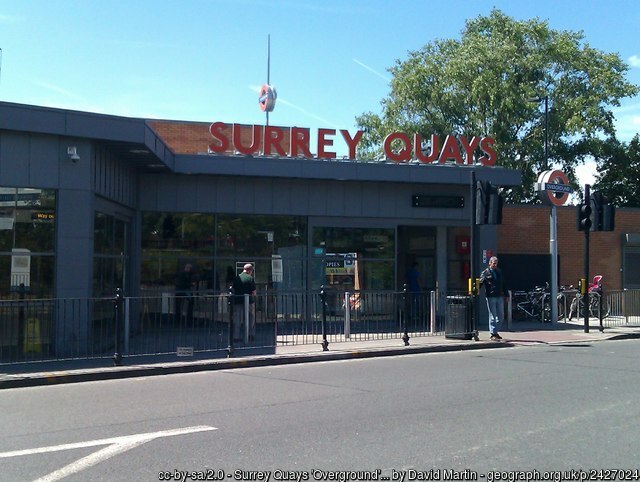 Plans to close the London Overground ticket offices at Rotherhithe and Surrey Quays have been abandoned. Rotherhithe councillors were among those who objected to the proposals which were also criticised by the London TravelWatch watchdog. Mayor of London Sadiq Khan said: “I am proud of the service the London Overground provides to hundreds of thousands of Londoners every day, and it is vital that we ensure stations across the network continue to operate in a way that best serves the needs of everyone travelling across the capital. “Proposals were being considered that would have resulted in the permanent loss of 27 ticket offices. However, having listened closely to the views of passengers and to the hard-working staff working at our stations I have asked TfL to ensure that no ticket officers will be closed permanently, and the busiest ticket offices will remain open to passengers exactly as they do now. RMT General Secretary Mick Cash said: “This is a significant victory for RMT members at the front line of the London Overgroundservice who led the campaign to stop this ticket office carnage and jacked up the political pressure to reverse the cuts. “It proves that trade union campaigning works. With a year to go, the partnership of Southwark Council, British Land and United St Saviour’s Charity has started awarding grants to local organisations for commemorating the 400th anniversary of the Mayflower sailing. Rotherhithe and North Southwark has a long seafaring and ship building history and was the place where Christopher Jones, the captain and part owner of the ship, and many of the crew of the Mayflower lived. So far, part of the £140,000 programme has gone to such diverse projects as Club Herop’s photojournalism initiative, Bermondsey Artist Group’s two year community multi-media programme, the Illuminate Rotherhithe festival, Art in the Park’s schools programme, an intergenerational theatre piece run by London Bubble and a number of local historical talks and events. Michael Daniels, President of Rotherhithe and Bermondsey Local History Society said he was delighted to be awarded a grant. He commented: ‘Our Local History Society organises illustrated monthly talks on fascinating subjects. During the summer of 2020 we will stage a mini-series of talks and walks about the Mayflower here in Rotherhithe’. Naomi N Dibum, Project Manager at Club Herop said: ‘By receiving this grant, every young person will create a range of work that represents the learning of their peers and understand the relevance of the Mayflower narrative today and the difficulties faced by the migrants during their journey’. Cllr Rebecca Lury, Deputy Leader of Southwark Council said she was really pleased by the range and quality of the applications received so far. ‘We have had a very impressive list of applicants, but the good news is we still have over £60,000 in grants to award as part of stage two and three. Therefore, I would encourage any local group, school or other interested party who have a project which is connected to the Mayflower, and use the application process on the Council’s website to apply for a grant’. Sarah Thurman, Head of Community Investments, United St Saviour’s Charity said: ‘We are delighted to support eight exciting community led projects that celebrate the story of the Mayflower. United St Saviour’s was 80 years young when the Mayflower set sail from Rotherhithe, eventually for the New World. Now 400 years later, it is great to remember Southwark’s connection to the historic voyage with our partners Southwark Council and British Land’. Eleanor Wright, Head of Community At Canada Water, at British Land said: ‘It was fantastic to see the first round bids and see the local Mayflower 2020 programme really taking shape. Congratulations to all the successful bids and thankyou everyone who took the time to submit entries’. The owners of Canary Wharf have criticised plans for a bridge across the Thames linking the Isle of Dogs with Rotherhithe. “We are concerned about the proposed walk and cycle river crossing between Rotherhithe and Canary Wharf,” says CWG in its written statement on transport schemes in London. “This is a very expensive and environmentally intrusive scheme and we believe the significantly cheaper ferry proposal should be properly considered as a more viable and attractive (to users) proposition. Last month Mayor of London Sadiq Khan said: “Transport for London (TfL) is continuing to develop the scheme, including aspects of design, construction and operation of this important new crossing. “As part of this, TfL is engaging directly with a number of stakeholders, including the Port of London Authority, London boroughs, land owners and local community groups. In its London Plan EIP submission, Canary Wharf also argues that greater capacity is needed on the Jubilee line in order to meet future demand. 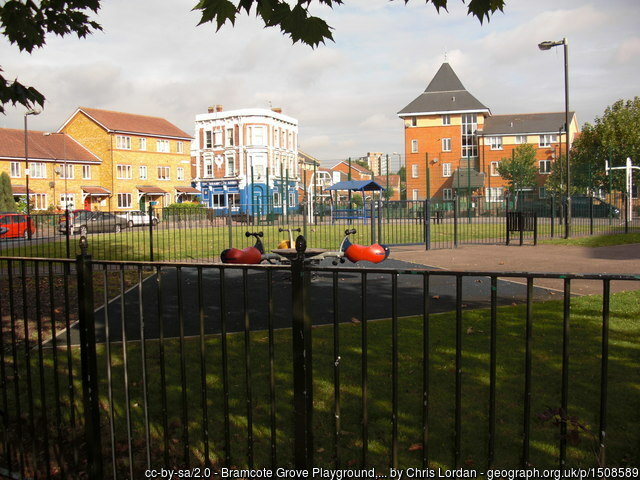 The Bramcote Estate in South Bermondsey is one of 11 areas around the capital to receive a share of the Mayor of London and Transport for London’s £53.4 million Liveable Neighbourhoods funding. Southwark Council bid for the funding from City Hall and TfL. The scheme at the Bramcote Estate will reduce car use by make walking and cycling much easier for local residents and connect the area with the future Cycleway 4 and Old Kent Road. Roads will be closed to through traffic, junctions re-designed and streets made easier to cross on foot. Links will also be improved to the Deptford Parks Liveable Neighbourhood, for which Lewisham Council was awarded funding last year. Further details of the project are available in this report. 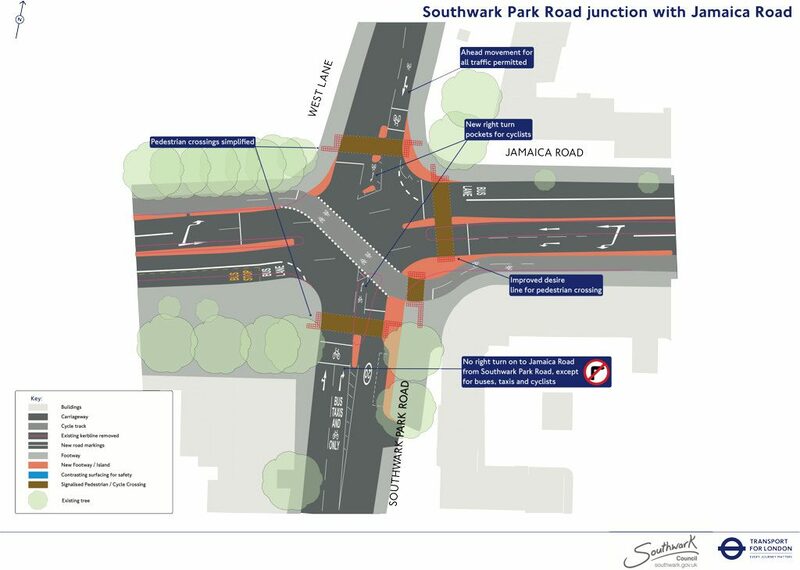 Transport for London and Southwark Council have launched a public consultation on revised plans for the Jamaica Road / Southwark Park Road / West Lane junction in connection with the new cycle superhighway. The new plans include banning the right turn out of Southwark Park Road on to Jamaica Road for all traffic except buses, taxis and cyclists. “This is in response to safety and congestion concerns raised regarding additional strategic traffic using Southwark Park Road to access Rotherhithe Tunnel,” says TfL. The public consultation continues till Tuesday 2 April. A £2 an hour charge for car parking is to be introduced in Southwark Park from 1 April this year. Southwark Council hopes to raise £200,000 a year by introducing car parking charges in the borough’s open spaces. There are 90 car parking spaces in Southwark Park. At present, car parking is free but there is a four-hour time limit. The new parking charge will be payable by phone, text or app. As part of the same package of measures, the council is planning to spend £28,000 on resurfacing and drainage works at Southwark Park, as well as installing new signage to advise motorists of the charges and how to pay. Further details are available in this report. Posted in Parks & open spaces, Transport. Southwark Council has served an enforcement notice on the owners of the Old Justice Pub on Bermondsey Wall East after work was carried out on the grade II listed building. Good afternoon. An enforcement notice has been served against works at the premises and an appeal has been lodged against it. We are currently waiting for a start date from the planning inspectorate. Meanwhile applications for planning permission (19/AP/0438) and listed building consent (19/AP/0439) have now been submitted to the council for works to create a roof extension to accommodate a new flat.